Shirts With Random Triangles: SEC Releases Schedule For SEC Media Days Schedule. 2015, SEC's Media Days will forever be remembered for the now infamous "SEC Shoe Wars," begun when Mississippi State head coach Dan Mullen wore a pair of Adidas Yeezy Boosts to the event. The moved was countered by Arkansas head coach Bret Bielema with a pair of Nike Air Jordan kicks that Uncle Phil's Misguided Children had blinged into a crime against humanity. Hugh Freeze used the occasion to pimp the Philadelphia, Ms. store that he bought his Johnson and Murphy's from. LSU head coach Les Miles came out the winner, casually mentioning in his opening remarks that he was "wearing regular shoes and socks." 2015 also marked the apparent final SEC Media Days appearance of former South Carolina head coach Steve Spurrier, who retired during the 2015 season. 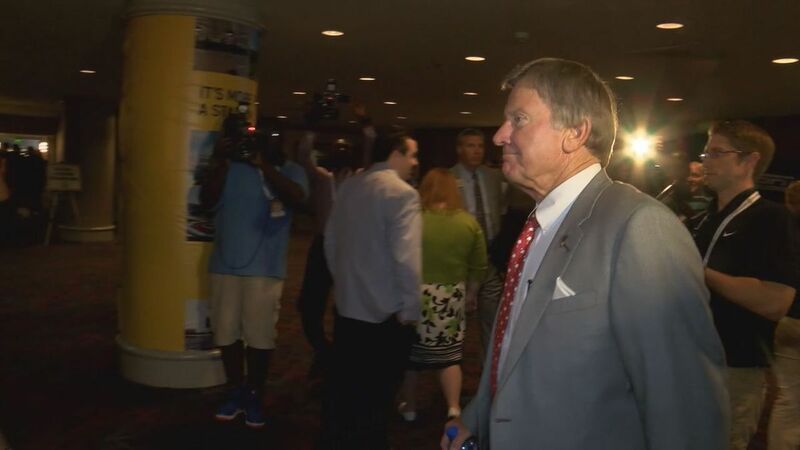 Hopefully, someone at ESPN and/or the SEC Network has the foresight to bring Spurrier in as an analyst. Here is the 2016 schedule for the media sessions of SEC coaches, along with that of SEC commissioner Greg Sankey.